Different cultures and countries around the world have their own traditions to celebrate Easter. Easter week starts with Palm Sunday and ends in Good Friday, and Easter Saturday and Sunday. In some parts of Europe, large bonfires, called Easter Fires, are lit on Easter Sunday and Monday to signify Spring being victorious over the dark-days of Winter. Whatever your traditions are, whether you like to eat chocolate bunnies or hunt Easter eggs, there’s always a good reason to light up your grill. Admit it that after a long cold winter, you really need to satisfy that inner pyromaniac in you. Hey, if you can use fire to cook a fabulous Easter meal, that’s all the better in my book. Of course, I’m exaggerating as I live in Los Angeles where our winter-spring transition was done in 70F weather and sunny skies! 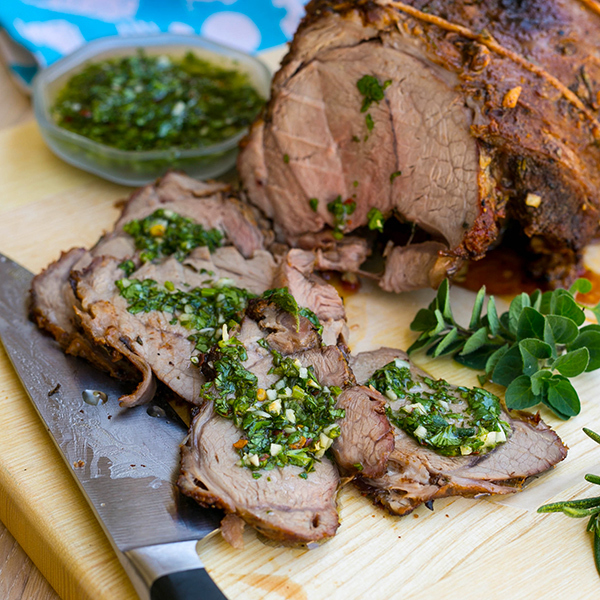 Nevertheless, in my household, I like to fire up a barbecued Leg of Lamb for Easter as it’s a welcome change from the traditional Easter ham. 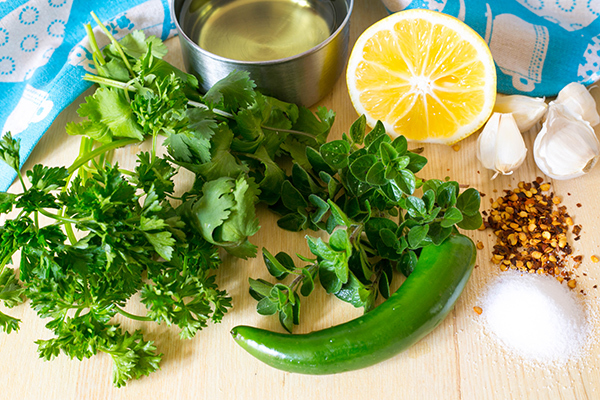 My easy recipe needed a condiment to kick it up a notch (thanks Emeril) so I paired it with a spicy and herbaceous Argentinian green sauce called Chimichurri which is used on grilled meats. It’s basically a salad dressing (oil and vinegar) with parsley, oregano, spicy chili, and garlic mixed in. 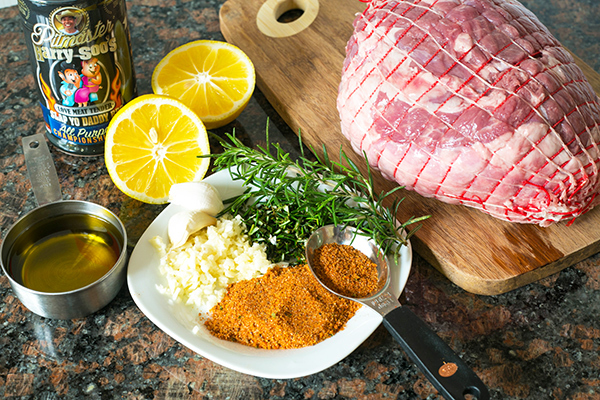 Not hard to make at all and it works well as a sauce or a marinade. 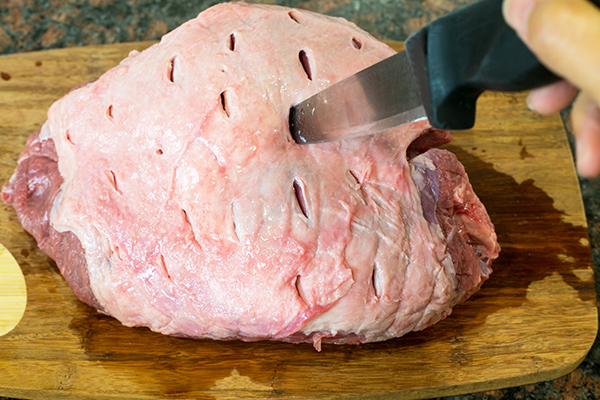 Use a sharp knife to make some deep cuts about 2 inches apart all over the lamb. 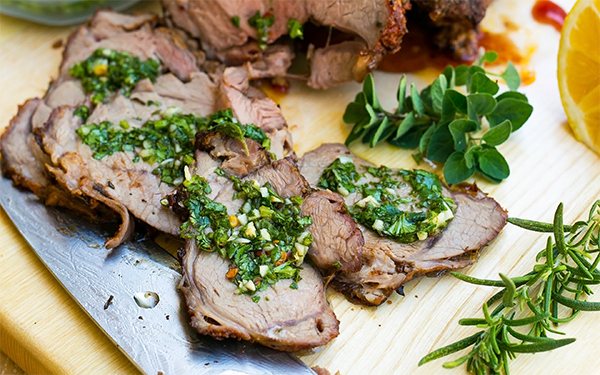 You can use bone-in or boneless leg of lamb. 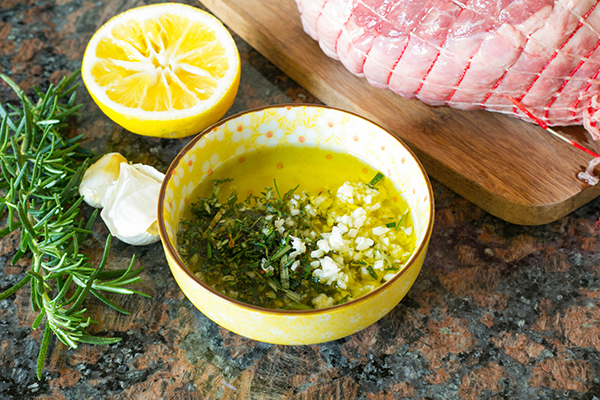 Combine ½ cup olive oil, lemon juice, chopped rosemary, and garlic in a bowl and rub the lamb completely ensure that all the nooks and crannies are covered. Sprinkle all over with a medium coat of SYD All Purpose Rub. 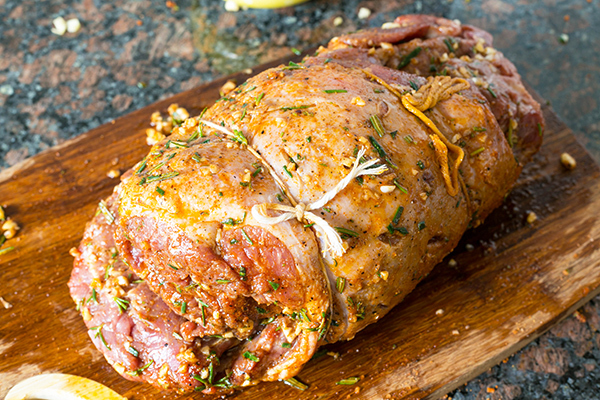 Tie up the boneless lamb leg in a log roll. Please lamb into 275F pit for some indirect smoking. Add your favorite wood chunks. I like apple wood with my lamb. 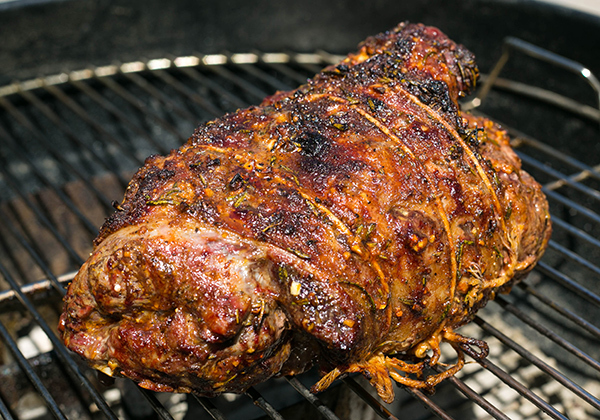 Smoke the lamb until the internal temperature is 110F (about 45-90 minutes depending on lamb size and your pit configuration). 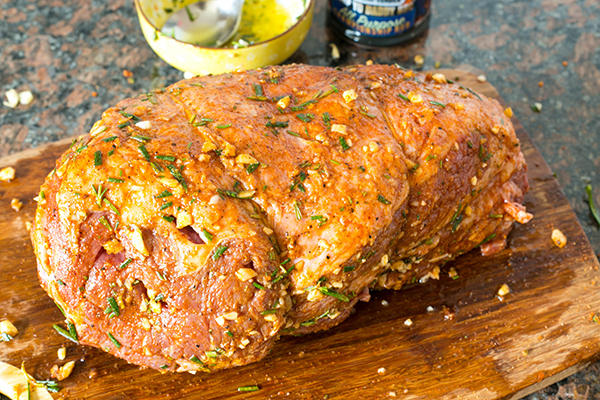 Once you reach temps, move the lamb over direct heat and roast until fat is rendered and skin starts to brown and char. Allow to rest for 10 minutes and cut into slices against the grain. 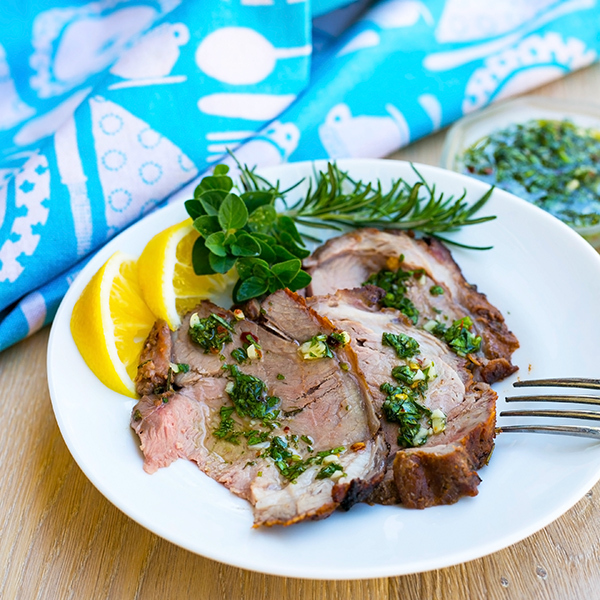 Drizzle with some Chimichurri sauce and serve with sauce on the side. I love leg of lamb on the grill. I also made this recipe a second time by substituting mint for rosemary. Mint work fabulously with lamb also. I like more garlic when I use mint. give this easy recipe a go and let me know what you think. Send pics to [email protected] if you can so I can share on Facebook. thanks.